So there are these two estranged sisters, Callie and Tricia, right? Callie, the younger, is coming to stay with pregnant Tricia to help Tricia deal with declaring her husband Daniel dead in absentia. Daniel disappeared seven years previous and no efforts to find him were successful. Callie had been out of her sisters life for number of years because she had been spending her time as a drug addicted transient. However, Callie has kicked the habit, converted to Christianity and is now back to help her sister deal with this situation. And that’s when things get really strange. The film shows both of them dealing with their respective demons through spiritual means. Callie prays every night before bed and runs every morning while Tricia uses Buddhist meditation techniques to clear her mind. Callie presses Tricia for the identity of the baby daddy, but Tricia is not forthcoming with that information. Tricia is also wrecked by guilt over the situation and sees ghostly apparitions of her husband telling her things like “I know what you did”. We learn that she is in therapy to deal with this situation and this is partly why she uses mediation to clear her mind of the hallucinations. Callie’s jogging route leads her through an tunnel where what looks to be a homeless man is living. He asks her to trade things with him. She feels bad for him and brings him some food to show compassion as part of her religious practices. He is gone by the time she gets back but she leaves it there anyways. Callie then comes home to find some gold chains and watches and keys left on the doorstop later on from the man. Meanwhile, Tricia fills out all the paperwork to declare her husband dead in absentia, and we find out who the baby daddy is, and how messed up that situation is. And it is at this point that things get really messy for the characters in one of the best scenes of the movie. I’m not going to go into the plot anymore until later due to spoilers. Instead, I’ll talk about my feelings on the film. 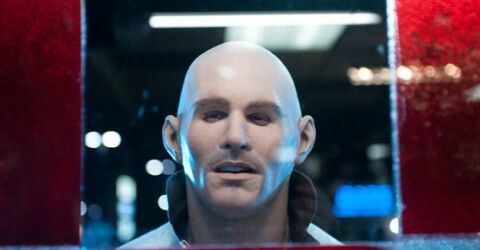 I really liked the premise of the film and the way the actors treated the characters like the broken people they are. You get the feeling you could possibly know them, or someone like them. It also helps that they aren’t Hollywood starlets occupying the roles; they are normal looking people. And it makes the viewer ask the question “At what point is it appropriate to move on?”. The theme of overcoming grief is something we can all relate to on some level. The film, of course, has some supernatural goings-on to explain the disappearance. The reasons behind are never fully explained or seen, which gives a strange realism to the movie. I don’t feel the story is quite up the to challenge of making the situation seem plausible but I commend it for trying to do so. The story is compelling but ultimately falls flat, like writer/director Mike Flanagan wasn’t exactly sure where to go with it himself. 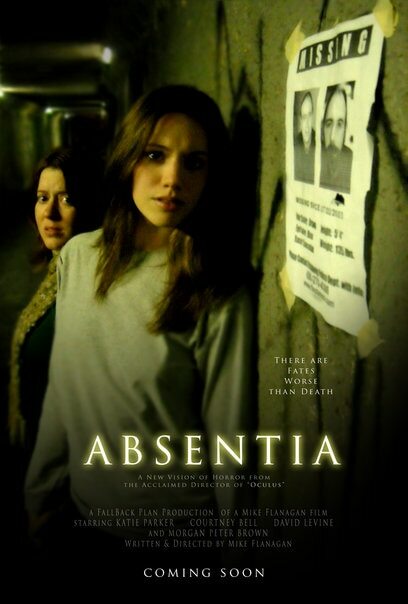 I have read lots of reviews talking about how scary Absentia is. For me, it was a bit unnerving, but never truly scary. The story is compelling and kept me watching (and not falling asleep, which is very commendable), and I didn’t feel like I was at a loss after having watched it. All this is a long winded way of saying I liked the film but didn’t love it, and I find enough here to recommend it to others. Now, I’m going to go into a bit of a spoiler and personal feelings here. In one scene Tricia and her babydaddy are going out on a date after her having just successfully David dead. As they are walking out of the house, she sees David across the street, and closes off her mind to block out the hallucination. Her babydaddy looks in the same direction and also sees him. This isn’t an hallucination, David has come home. Tricia is over come with emotion and passes out. After getting him settled back in, with him having no memory of where he’s been, David is again taken away from the sisters a day or so later. After my father died, I was plagued by dreams for years where he had faked his death due to lung cancer only to come back into my life to find that he was dying for real this time. These dreams are very vivid and disturbing and I’ve always hated them. I have a feeling after seeing this movie that maybe I’m not alone in this phenomenon. The feeling of relief destroyed by the event being relieved is emotionally devastating and I am thankful I no longer have them. These themes and my ability to relate to them are part of why I connected with this film and commend Flanagan for making it. It doesn’t all quite come together but the mood established is enough to keep it together. Absentia is currently streaming on Netflix. Give it a go. This is a good film and a good post. I like how you explained your personal experience and its connection with the film. Top notch post, man. I’ll definitely give this one a go soon. I have a feeling I will relate to it in a similar way that you did. Lemme know how you like it. It had some decent moments but generally speaking, I was quite let down by it. I didn’t expect very much from this movie. WRONG! It is terrific – well-worth the watch! Thanks for the comment, glad you liked the movie!